Teletics, Inc. Offer simple and elegant wireless communications that can withstand industrial environmental challenges, movement, and handling. Ease of install and operation of all their wireless systems make them ideal even for temporary situations such as military camps, emergency situations, civil defence and more. Industrial sites have unique communication challenges that often cannot be served by traditional approaches. Why should a field installer need to read a 50 page installation manual to set up a half dozen radios? Why should security require a complicated setup with dozens of settings and pages of menus? What is an access point and client anyway? If you can do it with cat5 or better network cable, then you can do it with the Teletics Airborne58. Their fully meshed 58 radio technology makes every radio a repeater. There being no Masters or Slaves, Access Points or Clients, is where the Airborne58 comes in. With Secure Setup in Seconds™ your field personnel can get back to what they do best. Teletics w*intercom system is designed specifically for rapid installation by personnel with minimal computer knowledge. The w*intercom wireless intercom family of products makes the entire system open and SIP compliant. The w*intercom system will work “right out of the box” plus it also allows Asterisk integrators and service providers a robust “industrial grade” wireless intercom, phone, internet, and public address platform which allows for rapid field deployment combined with simple custom development of special services and telephony options for specific field sites. ZipLine is now better than ever! Teletics just announced that the ZipLine 58 – “The fastest link between two points”. With the lowest cost and the most complete wireless phone line extender EVER user can choose from 1 or 2 line POTS service, or our brand new Wireless Digital Line Extender, the ZipLine DLE. Now in 5.8 GHz license free band to eliminate interference from WiFi, plus more secure than ever with AES grade encryption. All with the same price as the original ZipLine. ZipLine is the fastest, least expensive way to get phone lines and internet between two locations up to a mile apart. 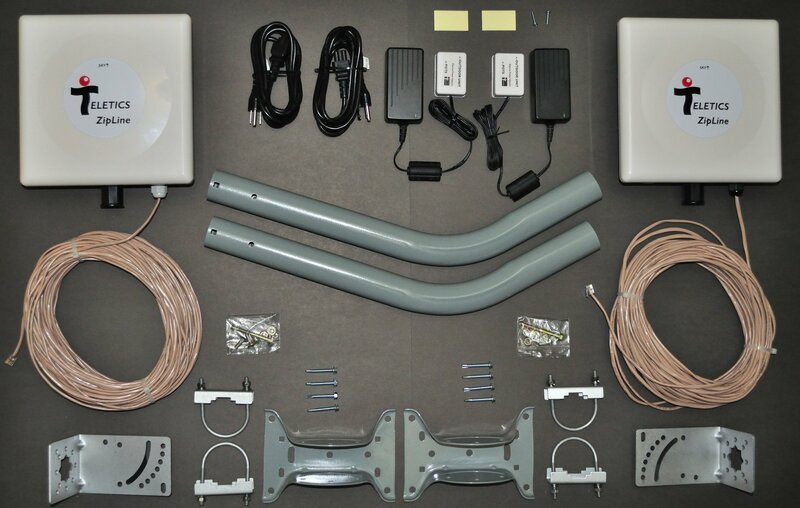 Everything you need for a complete installation is provided, including mounting brackets, and hardware. Installation can be completed by anyone handy with tools in under two hours. View a photo of what you get with a ZipLine. There is no Radio experience required and no specialty radio cables or antenna knowledge needed – Just plug and go! ZipLine can provide up to two phone lines and computer networking between buildings at a fraction of the cost of trenching cable. There are countless modems around the world in remote locations that provide access to vital business data. Electrical utility with revenue meters, or updating fuel prices, credit card verification. Possibly remote security sites, SCADA and telemetry modems. These are but a handful of examples of where remote modems are used. Teletics MoNet allows you to access these modems over the internet, or through cellular data networks, WiFi, or private Wide Area Networks. Cost savings versus phone line access can amount to thousands of dollars where MoNet is deployed. The best part is that ther is no need to change anything on your host computer to dial into a MoNet site – it’s just like using modems.